The Mississippi Entomological Museum, or MEM, has more than 1.6 million specimens of insects and adds more than 35,000 specimens annually. The museum, as part of the Mississippi Agricultural and Forestry Experiment Station, is an active research collection with seven full-time staff and several student workers. While the museum specializes in insects across the Southeast, it has specimens from all fifty states and as well as 48 countries including an extensive collection of more than 22,000 Panamanian moths and butterflies. The museum is one of the largest university collections in the Southeast. W.L. Giles Distinguished Professor, Richard Brown, has been the museum’s director since nearly its inception. Brown emphasized that while everyone at the museum has their own focus area, the spirit is collaborative. The museum began in 1980. That first year William H. Cross, U.S.D.A. ecologist and dragonfly collector, served as interim director. Shortly thereafter, Brown came on board. At the museum’s inception, a wing of what is now the Clay Lyle entomology building was dedicated to house the 220,000 specimens, which included the combination of the university’s collection, several private collections, and the departmental collection. Specimens date back to the 1890s, with a large portion collected from 1915-1930, and from around 1958, when Dr. Leon W. Hepner, an entomology professor, began amassing a large leafhopper collection. Recently, MEM acquired an additional collection from the University of Louisiana at Monroe, which included approximately 800 species and 15,700 specimens. JoVonn Hill, assistant research professor and grasshopper expert, learned about the Monroe collection through his research working with the Smithsonian’s grasshopper specimens, which is currently on loan to Mississippi State. “I was studying a type of grasshopper called Hesperotettix and when I went to look for the specimens in the Smithsonian’s collection, it said the drawer had been on loan to Dr. Herbert Wallace since the 1960s,” Hill explained. Through a bit of investigative work, Hill found out that Wallace, who died in 1984, had retired from the University of Louisiana at Monroe. He contacted the university and was able to retrieve the long forgotten specimens. He kept in touch with university officials there and when administrators found preserving the collection was something no longer viable for the university, Hill applied for MSU to acquire it. While Hill was interested in the collection’s nearly 2,000 specimens of grasshoppers, another find was an even bigger surprise. 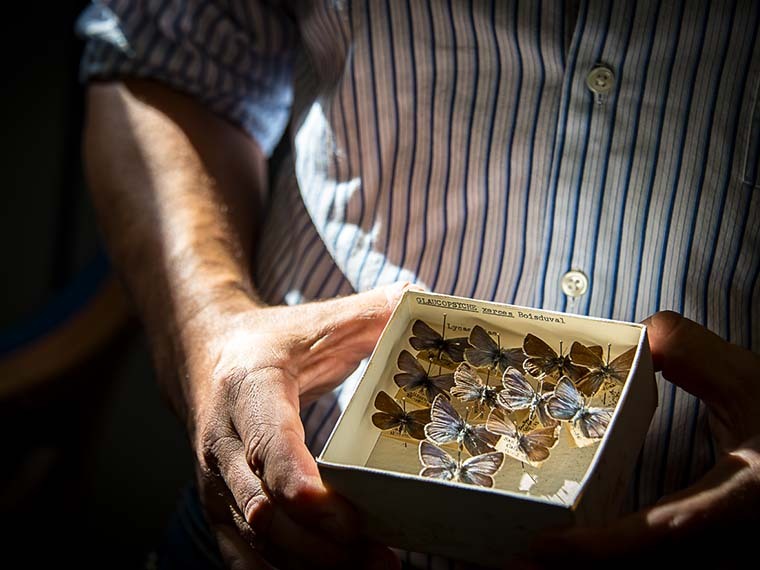 Once the collection arrived at MSU, a visit from an amateur butterfly collector revealed that the collection also included Xerces blue butterfly specimens, the first invertebrate species documented as having gone extinct because of human cause. The butterflies had a limited range which consisted of the sand dunes in San Francisco. Development encroached on the dunes in the 1940s resulting in loss of habitat and ultimate extinction. The ULM collection also contained a single specimen of the Miami blue butterfly, a related species that exists along coastal areas in southern Florida and is currently endangered. In addition to providing an invaluable glimpse into the past, the museum is also a first line of defense for invasive species. Jennifer Seltzer, research associate III and current doctoral student, works in the MEM Screening Center, funded by USDA APHIS through the USDA Farm Bill. The center identifies possible invasive species for the eastern United States. Pests the team screens include species of Lepidoptera, bark and ambrosia beetles, the emerald ash borer, and the kaphra beetle. For more information, visit mississippientomologicalmuseum.org.msstate.edu.